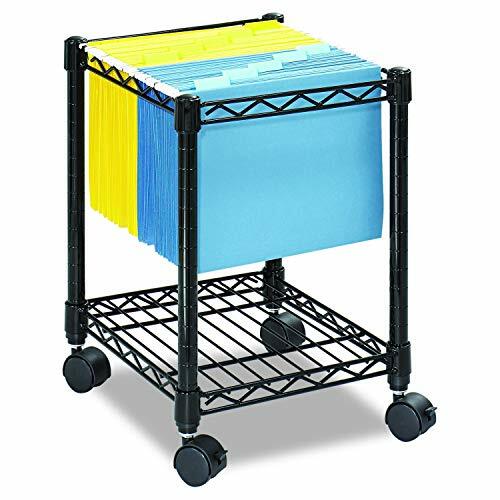 Safco Compact Mobile File Cart accommodates letter or legal-sized hanging folders to keep you organized and your workspace clutter-free. Constructed of steel wire with a black powder coat finish, the cart stands up to heavy, repetitive use to last for years. The powder coat finish helps resist chipping and scratching for a long-lasting professional appearance. The cart's four swivel wheels offer easy movement from room to room and two wheels lock for storage. The bottom shelf carries reams of paper, binders, books and office materials. 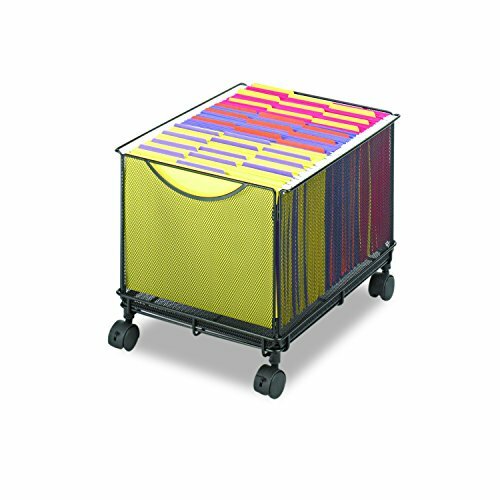 This versatile cart is designed for use in offices, mailrooms, cubicles, classrooms, dorm rooms and libraries. DUAL CAPACITY. 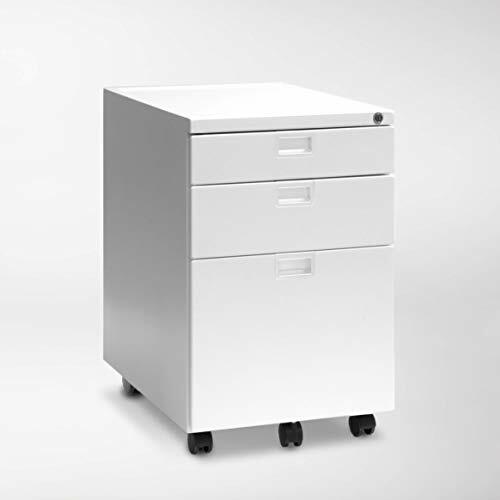 Safco Compact Mobile File Cart accommodates both letter and legal-size folders for maximum storage. Swivel wheels allow easy movement and the bottom shelf carries books, manuals, binders and office supplies. STURDY CONSTRUCTION. Manufactured with steel wire, the cart stands up through heavy, repetitive use. The powder coat finish helps resist chipping and scratching for a long-lasting professional appearance. MOBILE CONVENIENCE. Four swivel wheels allow easy movement between offices, conference rooms and meeting areas. The cart also tucks under most desks for storage to help save valuable space in small areas. BONUS STORAGE. The bottom shelf offers extra room for storing hanging folders, reams of paper, 3-ring binders, books and office materials. COMPACT DESIGN. Overall product dimensions: 15 1/2W x 14D x 19 1/2H, offering a small footprint with big storage potential. All-metal construction and lockable function keep your personal things protected. 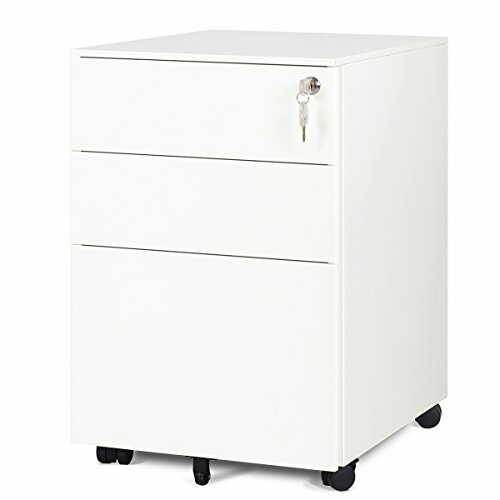 3 drawers mobile cabinet fits under most desks; One lock with 2 keys controls all three drawers. Five casters:2 front casters can be locked and 1 auxiliary caster prevents tipping; Fully assembled except the casters. 3 Drawer mobile file cabinet fits perfectly under most desks. One lock with 2 keys controls three drawers,add security to home and office. 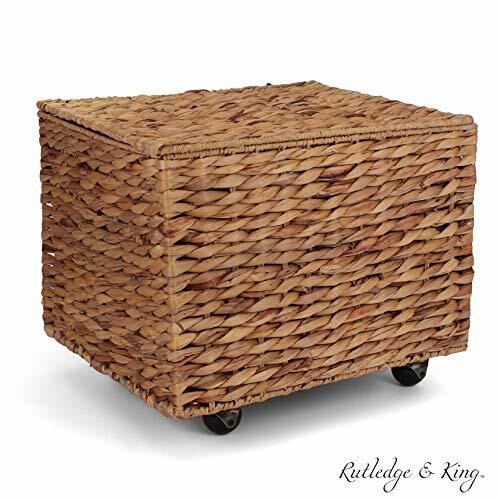 RUTLEDGE & KING SEAGRASS ROLLING FILE CABINET - The Rutledge & King filing cabinet is made from hand-woven seagrass and will add a designer touch to any home or office decor. Rutledge & King filing cabinets are the perfect solution for discreet and trendy file storage in cubicles, offices, homes, bedrooms, closets, and living rooms. DESIGNER STYLE - Traditional metal filing cabinets are bland and unattractive, however, the Rutledge & King seagrass filing cabinet can hold all of your important documents while sprucing up your office decor. Each all natural hyacinth basket is hand woven for a one of a kind blend of texture and color. SMOOTH ROLLING ACTION - The Rutledge & King file cabinet is equipped with four spherical casters for smooth and seamless movement. Each wheel has a steel ball bearing for increased mobility in any office or home setting. LOW PROFILE - The Rutledge & King hanging file organizer can hold all of you important documents and files while still maintaining a low profile. Each Rutledge & King file box can effortlessly slide under any desk space for easy storage. Keep your desk space neat and tidy with the Rutledge & King filing cabinet. DIMENSIONS - 17.5 Width x 15 Depth x 14 Height. Holds Letter Size Hanging File Folders. 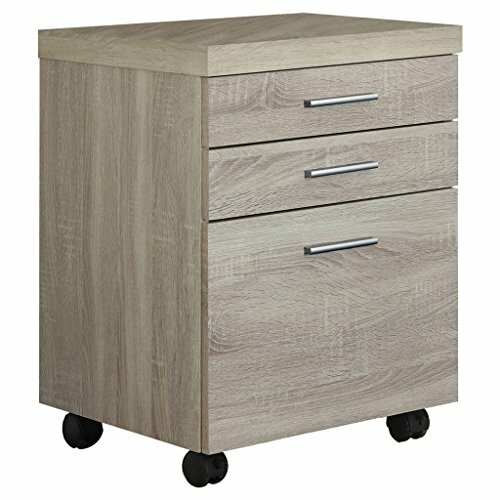 This is our attractive and practical rolling file cabinet, which is an perfectdecor to your home or office. Constituted by engineering particleboard and ironpipe, it is sturdy and durable. Four slide-out storage drawers provide largespace for your files or other daily supplies and make them placed orderly. Therolling design makes it more easier movement. Dark color makes it seamlesslymatch with any furniture and fit into any room. Make your office more efficientand orderly by using our file cabinet. Buy yours today! 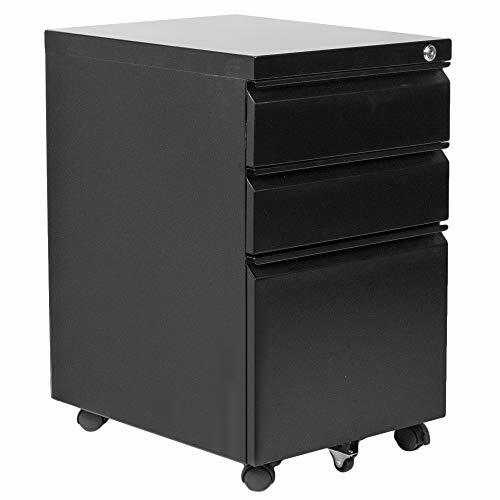 Easy to Move with 360 Degree Swiveling Casters - Four flexible wheels are assembled well at bottom of the file cabinet and they can swivel 360 degree, which brings you much convenience to move it in your home or office. But when you need it stop, it can also stay stable. Four Removable & Foldable Drawers Offering Ample Space - Four drawers provide sufficient room for you to store and classify your file or other stuff. They can be removed and be used separately. Besides, drawers can also be folded in a narrow size after use and greatly help you save much storage service. Sturdy Frame and Tabletop - The main frame of this cart is constructed of high-quality iron with durable black finish which make it more sturdy and powerful. The table top is made of particleboard which is sleek and flat and perfectly serves as a table. Easy to Assemble - The assembly work is easy. Detailed instruction and complete accessories are included. Specific assembly steps are listed for your reference. Various Usage - Not only is it used for storing and classifying your files and books but also for clothes, tools, toiletries in bathroom, office, bedroom, sturdy, living room etc. F4L-1 (Furniture for luxury Series) 1 year warranty and suitable for home office use. Material: Melamine and 0.71/1.8cm CARB P2 Class MDF Board, Nylon. 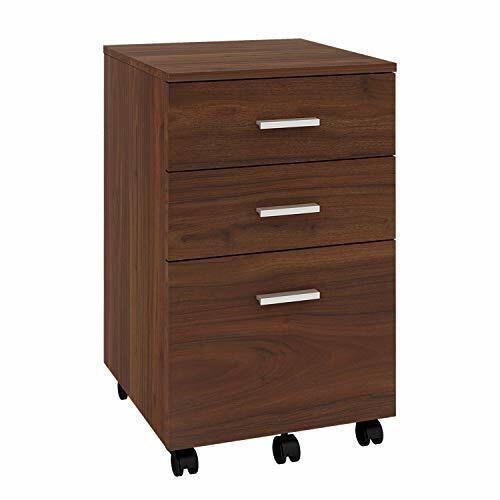 Wood Mobile File Cabinet, Fully Assembled Except Casters. You can complete the construction in 10 minutes (Have wrench in package). casters for ease of use and mobility: two casters can be locked, Center caster prevents tipping. One drawer accommodates hang letter size files. Single lock system secures all drawers, one key + one spare key. Drawers Bevel Edge Design: you don't need to assemble a handle. The surface looks clearly. * 4 Floating-like mobile casters and 1 center caster prevent tipping, fully assembled except the casters. A large number of items will be shipped through one of our several freight carriers by pallet or other measure. Please stay in touch with us by phone or email to make sure the goods arrive on time,we need to check the following information with you. * Appointment. Please make sure we have the best phone number to reach you. 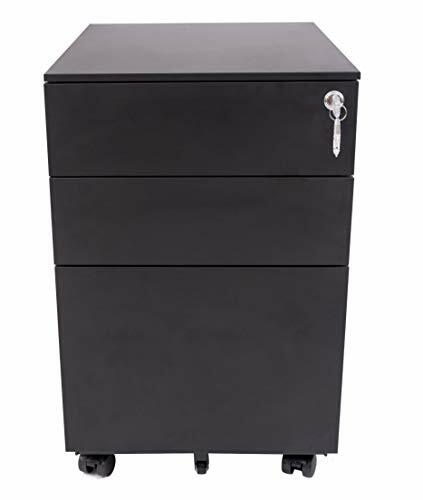 Commercial metal filing cabinet, overall dimensions: 15.4"W x 18.9"D x 26.6"H.
Mobile filing cabinet with a single lock mechanism that secures both drawers. High capacity file drawer accommodating A4, letter, and legal size hanging files. Full extension sliders allow drawers to slide in and out effortlessly. 2 front casters with braking function and 1 support caster to prevent tipping over. Fully assembled except the casters. Assembled with 1 year warranty. Get Onyx organized. Durable, contemporary mesh creates practical organization. This letter-size mobile file cube keeps hanging files easily accessible while allowing storage under your desk or work surface. Collapsible drawer design makes assembly a snap. Easy storage and access is only a push away. Steel construction with durable powder coat finish. Mobile on four swivel casters, 2 locking. *Fully assembled except the casters. File cabinet made from high-quality metal ensures durability and sturdiness. One key locks all three drawers and full extension glide avoids stuck. With removable hanging bar, the bottom drawer supports legal/letter size files. Front two casters are lockable, center caster prevents tipping; easy to move anywhere. Overall dimensions:15.3L x 18.9W x 23.6H, fully assembled except casters. Drawers Bevel Edge Design: you don't need to assemble a handle. The surface looks clearly. *One drawer accommodates hang letter size files. * Easy assembly with instructions provided,equipped with anti-tippling fittings for safe use. * Adjustable shelf range: 7.76"
The hardest thing about giving up your old stationary desk is losing the storage space. With a trusty Sidekick, you don't have to. The Sidekick provides you with three locking drawers and a top that makes a great spot for a printer or CPU. The Sidekick is the perfect companion for your desk, and doesn't sacrifice a unique and contemporary aesthetic. The Sidekick's 3 distinct drawer sizes allow you to safely store your pens, pencils, laptop, or hanging files under lock and key. The Sidekick file pedestal ships fully assembled (except for the casters) and includes two keys. Dimensions: 15.5W x 20.5D x 22.5H in; can accommodate A4, F4, letter sized and legal sized suspension files. 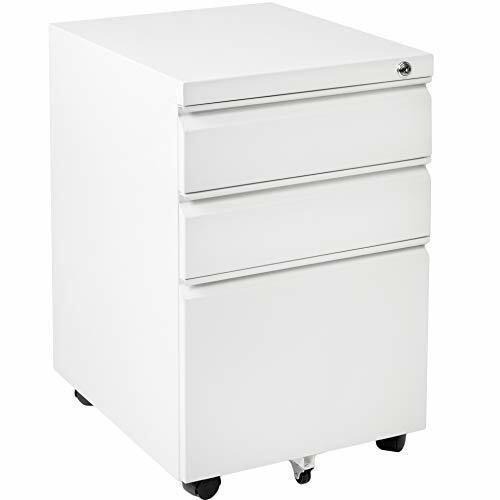 Convenience: Can move anywhere, the 24.5 high 3 drawer file cabinet easily fits under most desks; 5 casters, 2 lockable, 1 under the file drawer for added stability. Comes almost fully assembled except for the 5 casters. Reinvent your workspace: This mobile file cabinet keeps office supplies organized and files away important documents for a compact storage solution, can reasonably use space; morden style of the mobile file cabinet very fit office or home study. Firmness: STURDY and DURABLE, This pedestal is made of metal construction for long lasting durability and bears up to 200lbs in total. There's a caster in the front center to prevent the whole cabinet from tipping forward when you open a potentially heavy drawer. Lock secures all 3 drawers. Worry-free purchasing: ModernLuxe Brands backs its products with a 1-year manufacturer's warranty for worry-free purchasing. 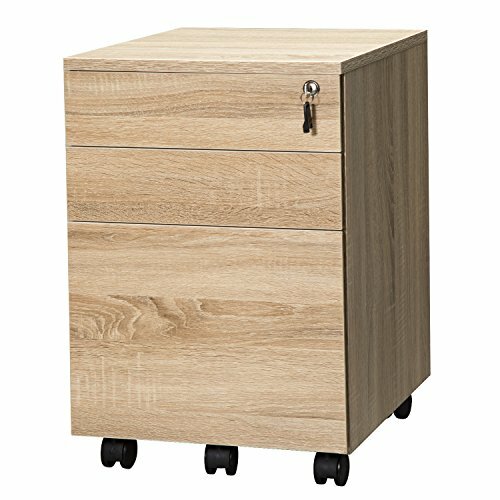 3-drawer filing cabinet design, 1 pencil storage drawer and letter size hanging file frame included. High quality drawer-glide suspension for smooth drawer performance. Solid metal construction with anti-rust electrostatic spraying finish for durability. Stylish wood texture color metal sheet surface, scratch and stain resistant. Easy-roll casters make it easy to move. 2 front casters come with brake function for safety. 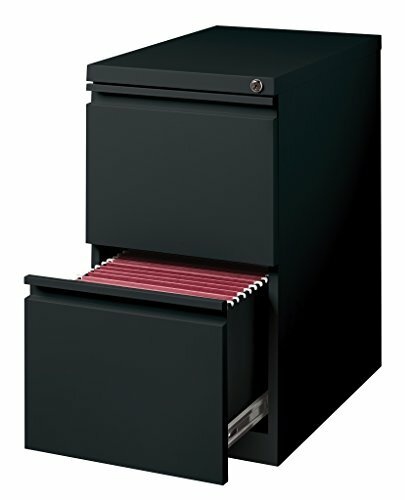 Keep your office supplies and paperwork organized with Black Mobile File Cabinet (FILE-MB01B) from VIVO! Three drawers provide significant storage space for important items and documents, and the cabinet is space efficient to accommodate a variety of workspaces. With a total height of 25.3", it fits under the majority of desks for added efficiency. If you need to move the cabinet to a different location, the five durable casters create smooth mobility with two being lockable for stability. Additional features include wheel slide tracks for quiet and smooth motion, a removable stationary tray for easy access to small accessories, and a locking feature to keep your documents and belongings protected. We even provide a spare key for backup. Minimal assembly is required out of the box, and hardware is included for attaching the five casters. You'll be enjoying your new filing cabinet in no time! Product Dimensions: 15.5" x 19.8" x 23.3"
Inner Dimensions of Top 2 Drawers: 13" x 16.6" x 3"
Inner Dimensions of Bottom Drawer: 13" x 16.6" x 10"
VIVO OFFICE STORAGE SOLUTIONS - We create affordable solutions designed with creativity and quality to transform your unique workspace. 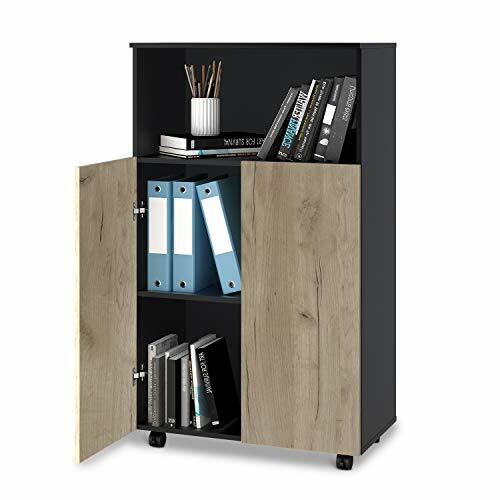 FILE-MB01B is a black file cabinet that's perfect for increasing organization at home or in the office. SOLID STEEL CONSTRUCTION - This 15.5 x 19.8 x 23.3 product is built for long-lasting performance with solid steel construction, supporting up to 330 lbs. Its sleek and elegant appearance will add style to any office setup. 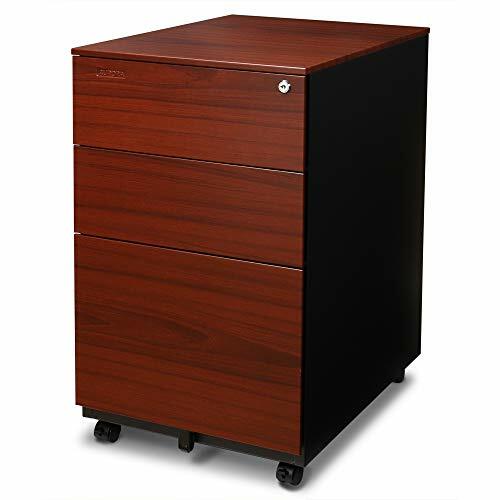 2-drawer filing cabinet design, 2 letter size hanging file frame included. 2 full high-side drawers accommodate letter-size, hanging file folders. 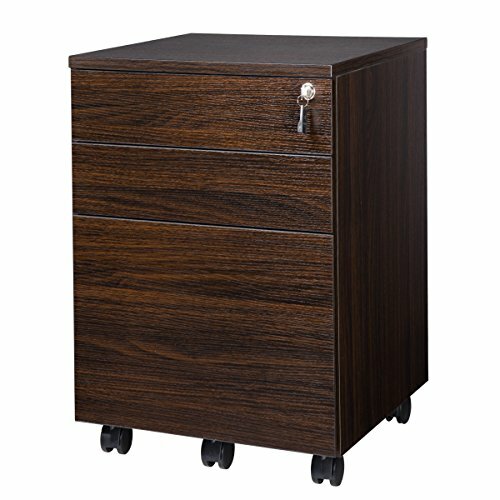 Lock secures all 2 drawers to keep your files and items private. Interlocking feature allows open only one drawer at a time for safety. Unit Size: 15.5 W x 20.7 L x 25.1 H.
Functional and stylish, the Glide file cabinet is the stylish destination for your most important files. 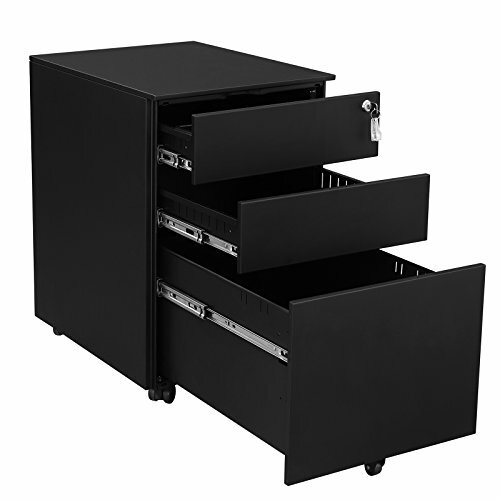 Steel-constructed to protect whatever goes inside, it features three Glide-locking drawers with two fold-out keys and a pencil tray. 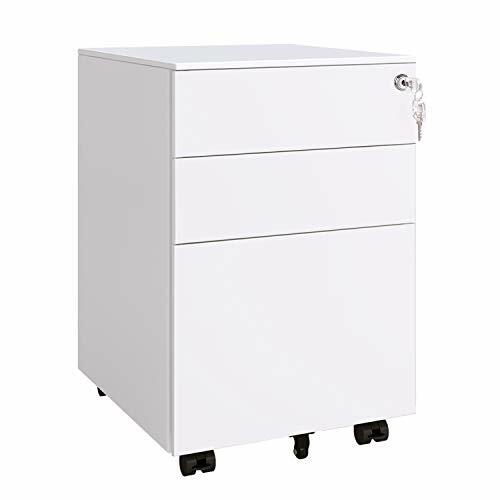 Comes with two drawers to hold whatever your heart desires, a file drawer that supports both letter and legal-size hanging files, 360-degree swivel wheels underneath and is coated with a Matte white powder finish. Available in 4 colors. 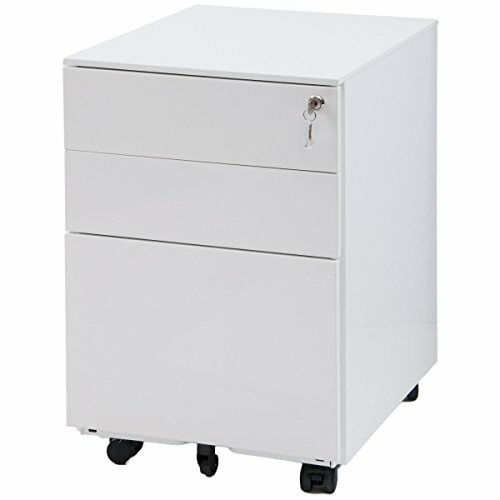 Keep your office supplies and paperwork organized with White Mobile File Cabinet (FILE-MB01W) from VIVO! Three drawers provide significant storage space for important items and documents, and the cabinet is space efficient to accommodate a variety of workspaces. With a total height of 25.3", it fits under the majority of desks for added efficiency. 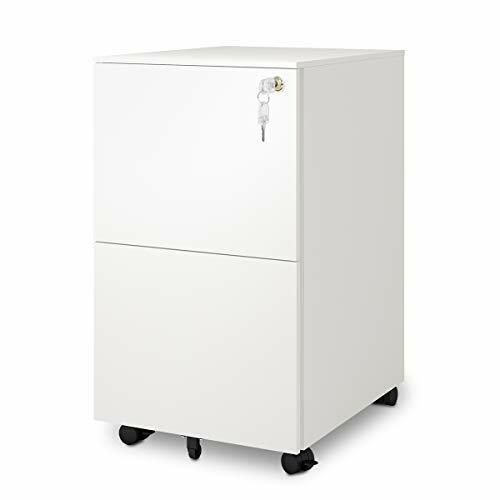 If you need to move the cabinet to a different location, the five durable casters create smooth mobility with two being lockable for stability. Additional features include wheel slide tracks for quiet and smooth motion, a removable stationary tray for easy access to small accessories, and a locking feature to keep your documents and belongings protected. We even provide a spare key for backup. Minimal assembly is required out of the box, and hardware is included for attaching the five casters. You'll be enjoying your new filing cabinet in no time! VIVO OFFICE STORAGE SOLUTIONS - We create affordable solutions designed with creativity and quality to transform your unique workspace. 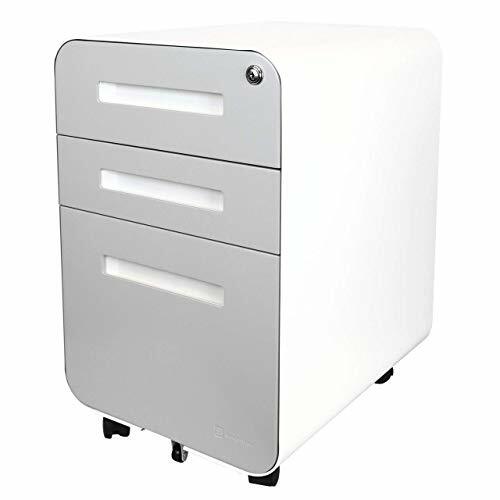 FILE-MB01W is a white file cabinet that's perfect for increasing organization at home or in the office. You love the sleek, minimalist look of your standing desk, but a little extra storage room would come in handy. Fortunately, Stand Up Desk Store's 15 inch wide 3 Drawer File Cabinet / Rolling File Cabinet provides plenty of room for your letter or legal sized hanging files, pens, sticky notes, and more. Highlights include a fifth wheel that stabilizes the bottom drawer when it's pulled out, and a safety mechanism that prevents multiple drawers from being opened and tipping the cabinet over. These features eliminate the need for a heavy counterweight. The included organizer tray keeps your pens and paper clips tidy, while the adjustable rail makes it easy to hang your preferred paper size, whether that be letter, legal, or A4. Four high quality 1.5 inch locking casters deliver effortless mobility. ADDS STORAGE: Stand Up Desk Store filing cabinets deliver convenient storage of letter or legal hanging files, a purse, office supplies, and more. This helps you reduce desktop clutter and become better organized. 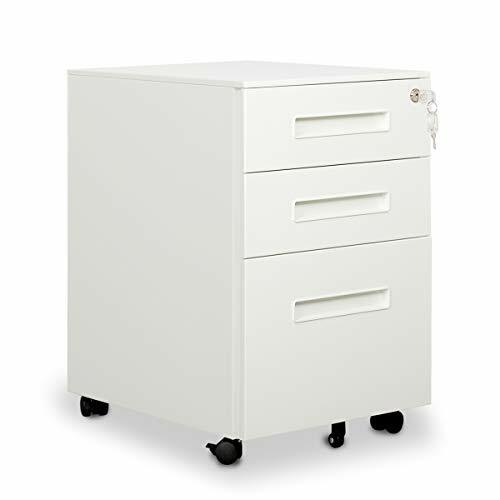 STABLE: By placing an extra wheel under the front edge of the bottom drawer, the rolling file cabinet is fully supported when opened. A safety mechanism prevents accidental opening of multiple drawers. This eliminates the need for a heavy counterweight. SECURE: A key lock (including two keys) will help keep your valuables and files safe when you're away from your desk. 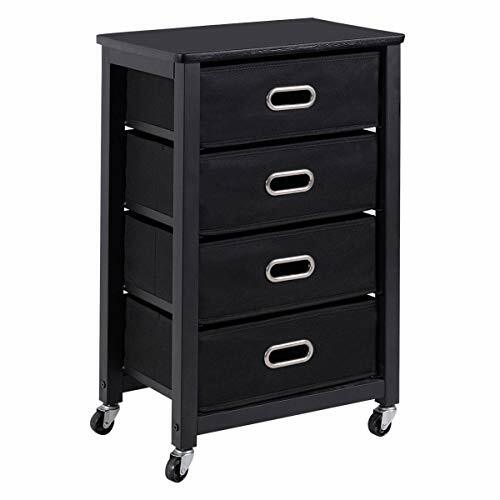 STURDY: Offering heavy-duty steel construction and sturdy 1.5 inch locking casters, this metal filing cabinet is built to last. 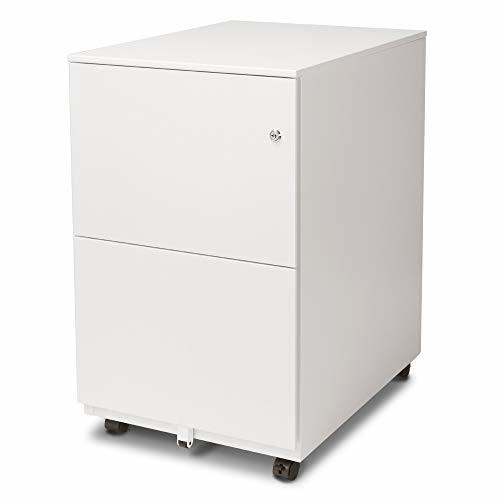 FITS MULTIPLE FILE SIZES: At 15.4 inches wide, this locking file cabinet offers a generous amount of storage space.